Check out this recent article about Kenny and Rahul Sharma, or click "read the rest of this entry" to read it on the page! Kenny was interviewed on The Wave this morning Feb 10th, and you can read the article and listen to the broadcast by clicking the article title below! 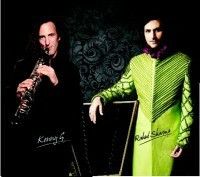 Also- Don't miss the upcoming 94.7 The Wave's Valentine's Date with Kenny G & Michael Bolton on Monday, Feb. 14! Get your tickets today! Check out the teaser for Kenny's Superbowl commercial here: https://www.youtube.com/audiusa or click on the FEATURED VIDEO to the right to watch it! Watch the commercial that ran during the Superbowl (part 2) here!